Taphophile Tragic — just in time for Halloween! I know some of the visitors to this blog might not celebrate Halloween, but it’s my favorite holiday (because I like the whole pumpkin-carving, ravens in my windows, spooky kinds of things for a month….). 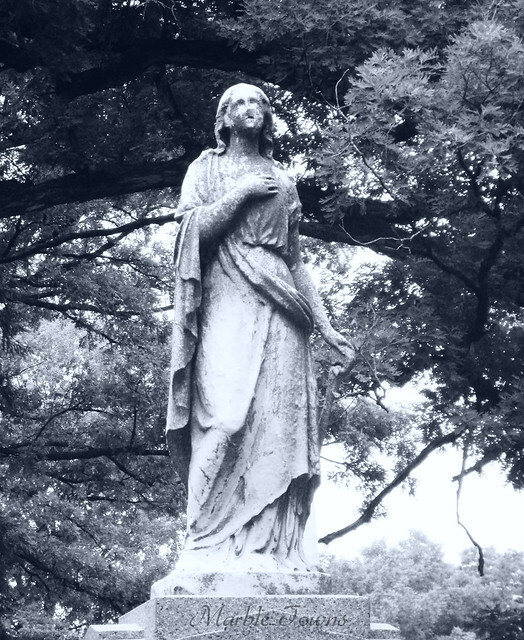 While I’m not a horror-movie, blood & gore, scary scary scary Halloween kind of girl, I do like that it’s a time to reflect on some of the things that might seem a little dark, like cemeteries. 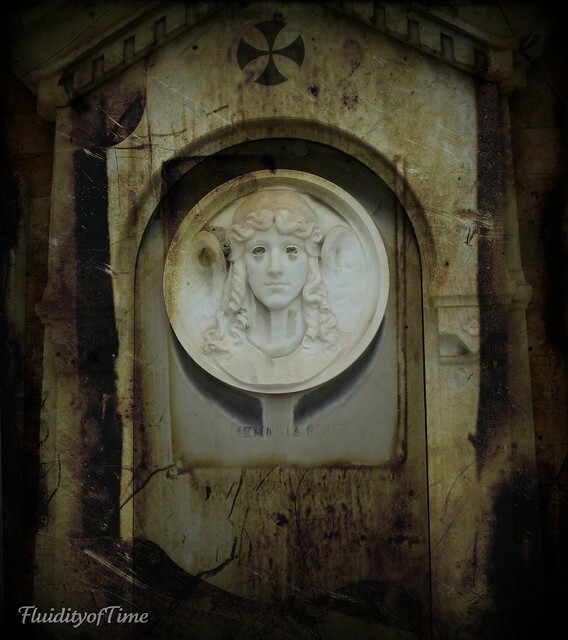 Welcome to the Halloween edition of Taphophile Tragics on this blog! And welcome to my new (and hopefully, improved) blog-in-process. I did upgrade, so while it might not look very different, I do have a new domain name: http://marbletowns.com. Also, the Linky tool should work properly now (fingers crossed). I’m submitting a few of my favorite Halloween-y/spooky modded photos this week, and I’m very excited to see what everyone else has this week. Welcome! So, stay tuned for an update — but I should be up and running on my regular schedule next week. 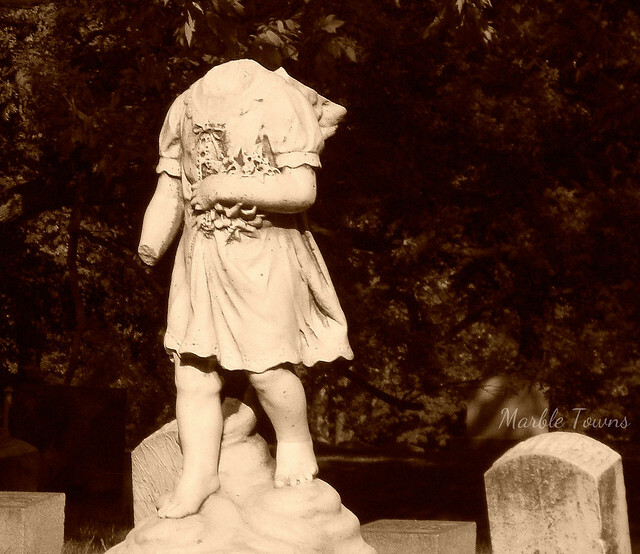 Welcome to Week #37 of Taphophile Tragics on this blog! I look forward to seeing what everyone has to share this week — so thank you very much for stopping by! 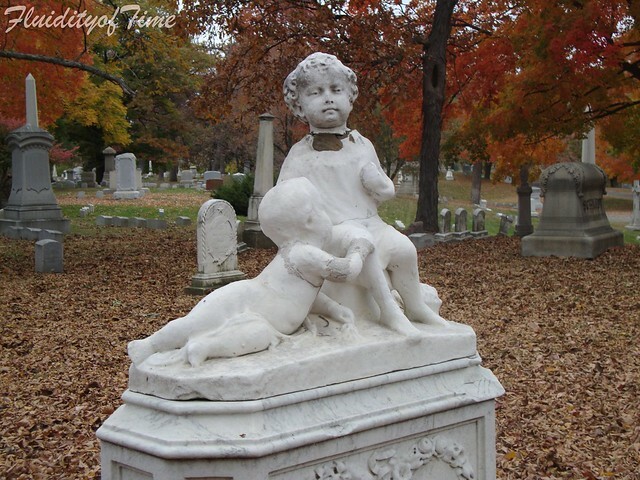 She is found in the Old City Cemetery in Galena, Illinois. 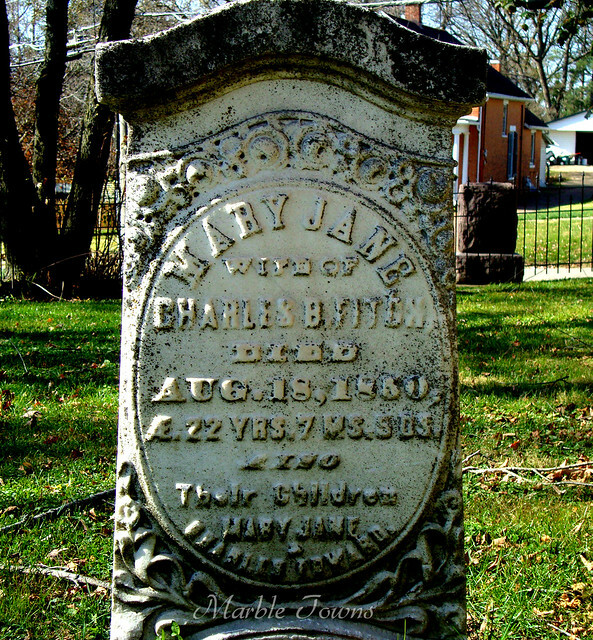 I wasn’t able to find anything about Mary Jane or her husband (probably because I wasn’t sure if I was looking for Bitton, or Button, or another name). They don’t seem to be listed on Find a Grave, either. But, this cemetery has changed over the years, and I’m thinking perhaps some of the information isn’t available. I don’t know if this woman and her children died around the same time, but I’m thinking they might have, since there are not individual years for the children. 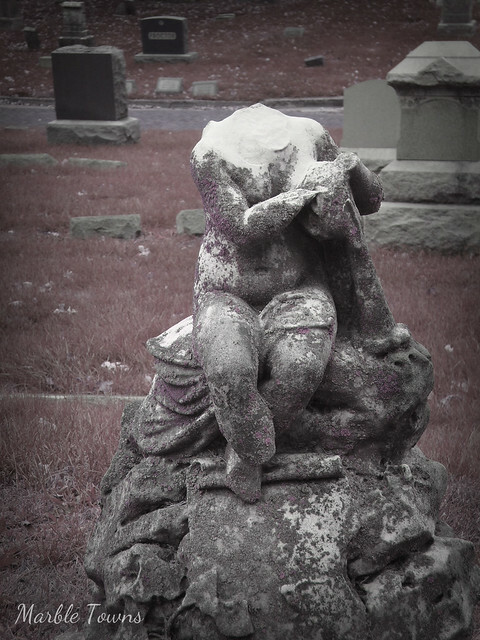 In October (which is my favorite month), I like to not only visit cemeteries and take photos, but I like to give some of those photos spooky effects. This time of year, there are a lot of fake gravestones that people decorate their yards with, and this reminds me how many people find cemeteries to be spooky or creepy. So, why not modify some of my photos for the season? I don’t have anything fancy like Photoshop, but I can do a lot with sites like iPiccy, which is free and web-based. So, I think I might share some of these during this month. Welcome to Week #36 of Taphophile Tragics on this blog! I hope you’ll share some comments, and some of your own posts. 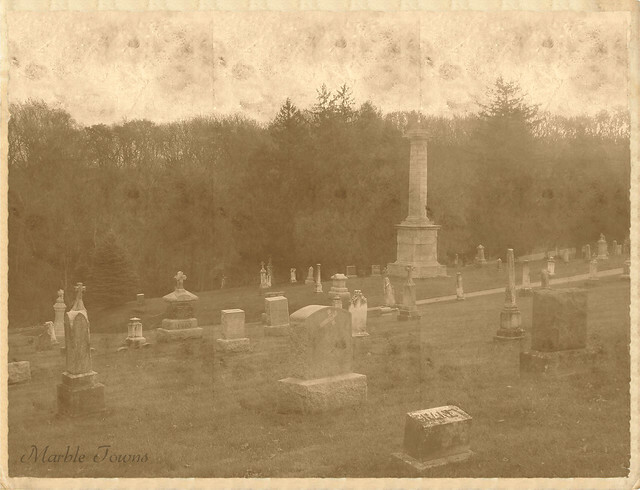 ________________________________________________________________________This week, I’m writing about the fire in Peshtigo, Wisconsin on October 8, 1871. That date may sound familiar if you know anything about Chicago history, as it was the date of the Great Chicago Fire. However, many people who know about the Chicago fire have no idea about the devastating firestorm which occurred on the same date, north of Chicago, in the small town of Peshtigo. Some of my family comes from Peshtigo, and although they didn’t arrive there until the late 1880s (after the fire), I have always known about the fire. 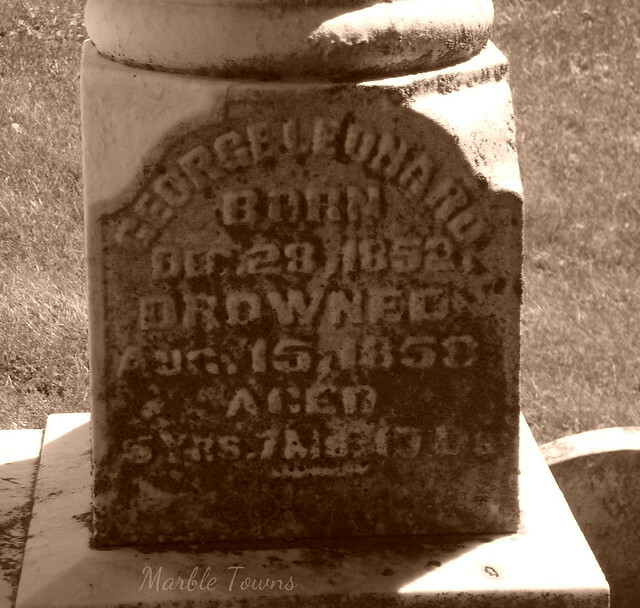 This summer, my husband and I drove up to Peshtigo and visited the Fire Museum, and their cemetery. You may read all about the firestorm here on this site, which has a great deal of information. I’m just putting some information here on my post, but I’d encourage you to read more. This fire on October 8, 1871 was the worst recorded forest fire in North American history, and in Peshtigo, basically decimated the town. You will note that I use the word “firestorm” to describe it — and that’s what it was: a horrifying storm, a fire so huge that it creates its own wind system. Because it draws in more oxygen than a regular fire, the heat is extremely intensified — hot enough to incinerate a person into ash. The Peshtigo Fire Museum is adjacent to the Fire cemetery. Their volunteers are very well versed in the events of the fire, and the museum, itself, is very nicely done. The artifacts from the fire are displayed and include a charred bible, where some of the words can still be read, even though the paper is blackened to a crisp. Visiting the cemetery was sobering. 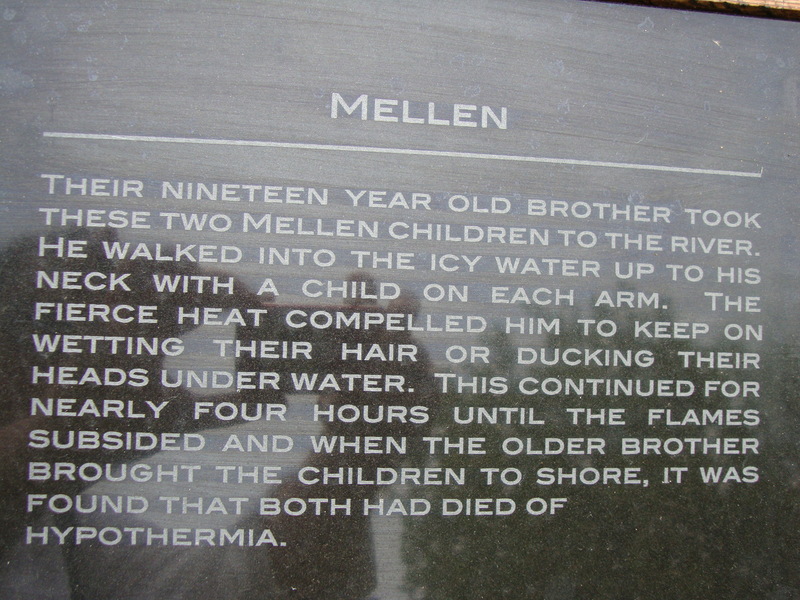 It’s in very nice condition, and they have several plaques which tell about some of the families. They also have a mass grave for the 300 bodies which could not be identified. 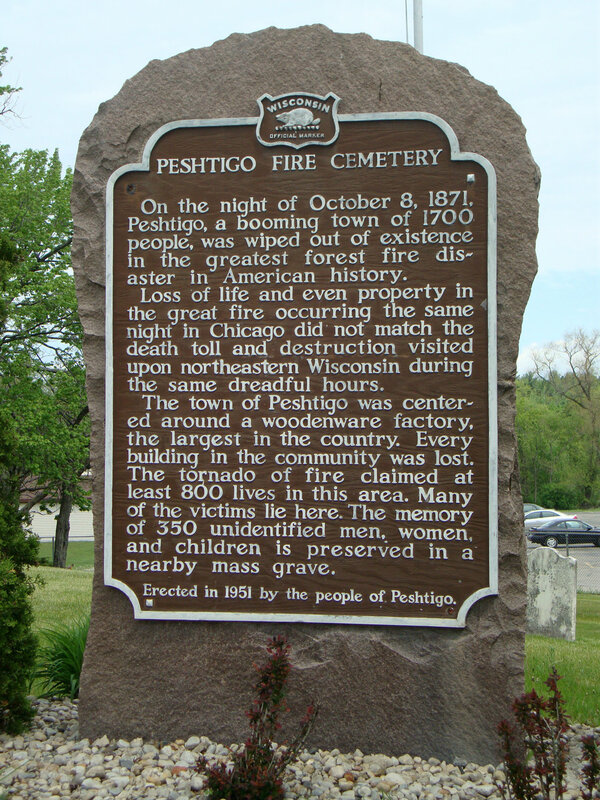 Every October 8th, I take a few moments to remember not only the Chicago fire, but also the people of the town of Peshtigo. When do the dead die? When they are forgotten. Exchanging ACEOs for just one pebble!